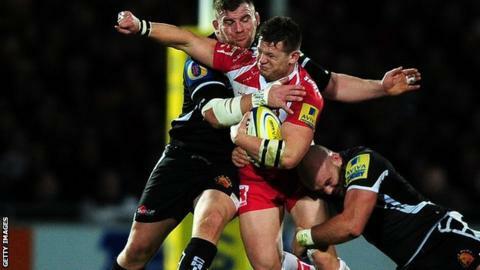 Gloucester hung on to beat Exeter Chiefs in a thrilling Premiership match which saw the lead swap seven times. Greig Laidlaw booted two penalties to put Gloucester 6-0 up at the break. Billy Twelvetrees added to the advantage with a drop-goal but tries from Jack Nowell and Matt Jess edged the Chiefs in front for the first time. Tom Savage and Ben Morgan then put the visitors ahead before Gareth Steenson's missed conversion after Thomas Waldrom's try proved costly for Exeter. The lead swapped another four times after Savage went over, with Steenson kicking two penalties and Laidlaw adding a third of his own before decisively converting Morgan's effort. It was Gloucester's second victory in seven Premiership matches and moves them up one spot to eighth in the table. The Defeat was Exeter's third in succession and came as they celebrated their 100th Premiership match since winning promotion to the top flight five years ago. Laidlaw teed up the opening points for the visitors with a penalty on three minutes, while Jess went close to touching down at the other end soon after. Nowell was next to threaten the visitors, kicking the ball ahead of himself before being bundled over in pursuit. The television match official eventually ruled against a penalty try as the England winger was shoulder to shoulder with Gloucester's Jonny May as they tripped over each other. While the Cherry and Whites did not have a lot of attacking possession, Laidlaw added to their advantage with the boot after Moray Low was penalised at the scrum. Meanwhile, Steenson, the Premiership's most accurate boot so far this season, failed to get Exeter on the board with his first kick at goal after Gloucester were penalised for holding. Twelvetrees put the visitors 9-0 up with a superbly hit drop-goal before Nowell crossed for the first of three tries in five minutes that sparked the contest into life. Nowell shrugged off two attempted tackles to cross for the game's first touchdown and Jess collected a stray Twelvetrees pass on his own 22m line to put the hosts ahead for the first time on 50 minutes. Savage then levelled, charging down Steenson's kick before coolly collecting to power over. Laidlaw's conversion made it 16-14, with the lead swapping three more times in five minutes as Steenson landed two penalties either side of Laidlaw's third three-pointer of the game. England number eight Morgan, who signed a new deal earlier in the week, then crashed over to put the Cherry and Whites back in front. Laidlaw crucially added the extras as the TMO awarded Waldrom a try at the other end, only for Steenson to crash his attempted conversion off the post. "There were certain elements of the game which didn't go well but ultimately today was all about the result. "(In the) second half it was just back and forward, probably hard to sum up in just a couple of words, we conceded points too easily but we're delighted to get the win. "We got that little bit of luck - Gareth (Steenson) hitting the post with the last kick - so today was an important start of a new year, still 10 games to go in the league and that's given us hopefully the little bit of a kickstart to gain some momentum over the next few weeks."